The last few posts were about my Not Just Vegetarian eating experiences in Cancun. Am taking a break from the Cancun series to tell you about my (now) favorite brunch spot. Will be back to the Cancun series in a few days. 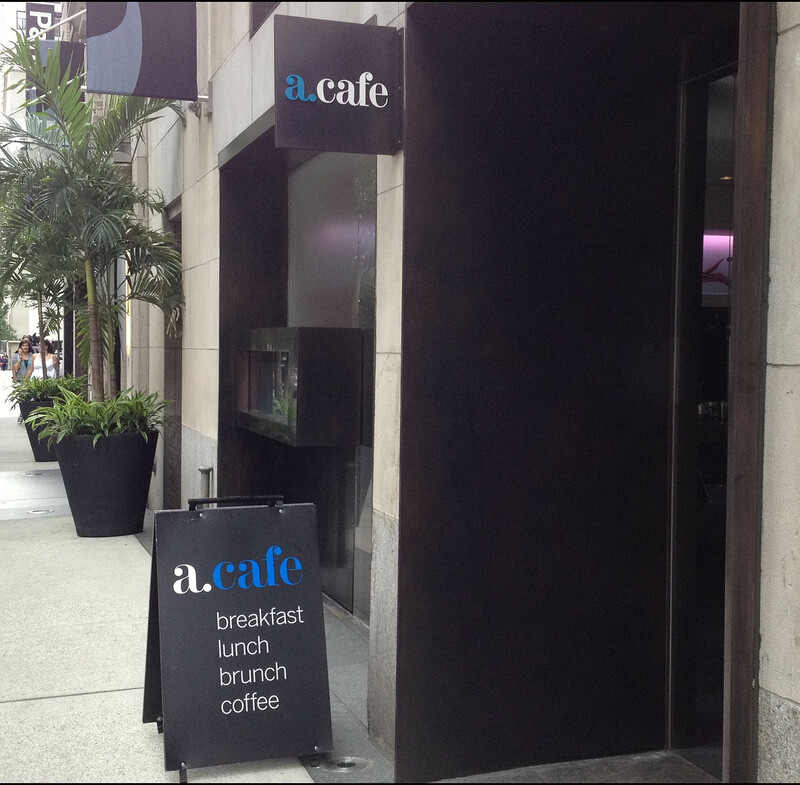 “a.cafe” is a cafe in the AKA hotels or serviced residences in midtown NYC. It’s easy to miss this cafe as you walk by. On one of our many attempts to get our daughter to fall asleep by walking her stroller, we walked in (after she slept, as you might have guessed) as it was the closest cafe near us on that day. 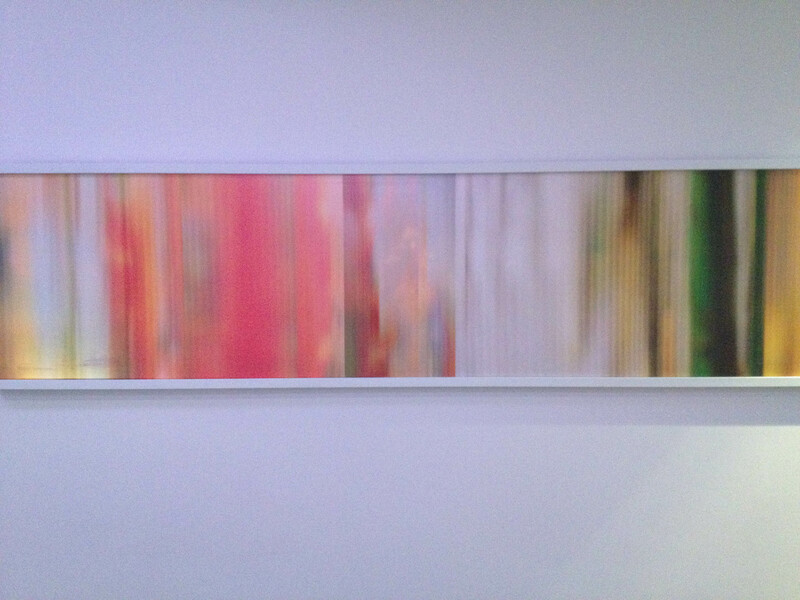 a.cafe’s decor is very modern with a minimalist style. a.cafe offers a variety of seasonal dishes and a number of healthy options. Our usual brunch includes a standard order of a plate of scrambled eggs with smoked salmon and whole-wheat toast with a side of salad (instead of fries). Other dishes that we have had and which have tasted excellent are the salmon burger and the market salad. 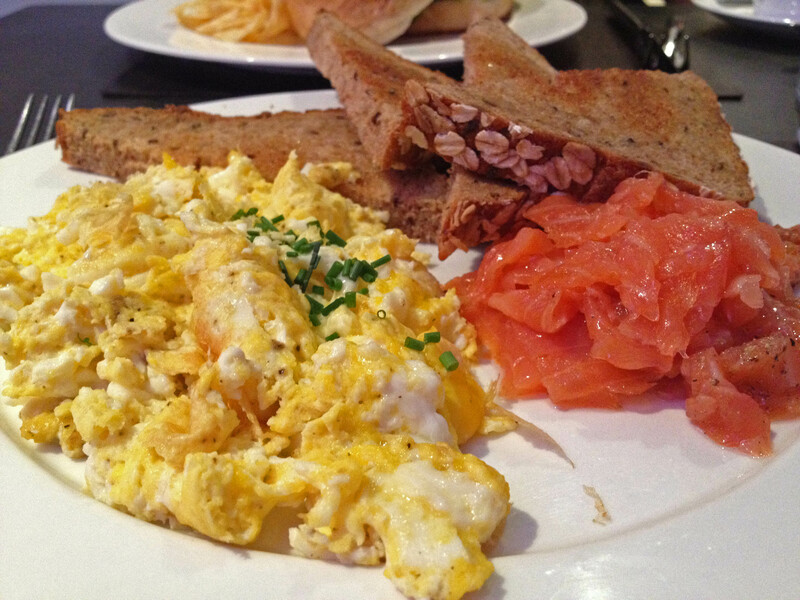 Scrambled eggs with smoked salmon, whole-wheat toast and a side salad: This is one of my favorite dishes for brunch and a.cafe serves top quality scrambled eggs with smoked salmon. The eggs are fluffy, feel creamy, and adequately salted. I love the small pieces of chive snipped on the eggs. I always wonder why in other restaurants and cafes, the omelettes and scrambled eggs taste as though there is no salt added. I understand that the Bloomberg administration is imposing restrictions on the usage of salt in restaurants and cafes in NYC, but there is time to implement these until 2014. I am not sure if restaurants are keen to adhere to these, but often dishes seem under-salted. (I know that I am making a very generic statement here without substantiation, but that is how dishes taste in my opinion). I am (also) aware that one can always add salt to a dish later (i.e., after it’s served) and thereby prevent over-salting, but can that be an excuse for a dish to taste as though it has no salt? … Anyway, back to the dish now. The smoked salmon is extremely fresh and full of flavor. I think smoked salmon tastes best when it’s not cooked, and so, I ask for it on the side. Additionally, I ask for the whole-wheat toast – one of the many bread options at the cafe. The best part of the toast is that it arrives warm and buttered. If you do not want your toast buttered, make sure you let them know. One pet peeve of mine about a.Cafe – they always charge extra to give a side of greens (instead of the fries). How can the US ever not be obese if it’s cheaper to eat unhealthy food? 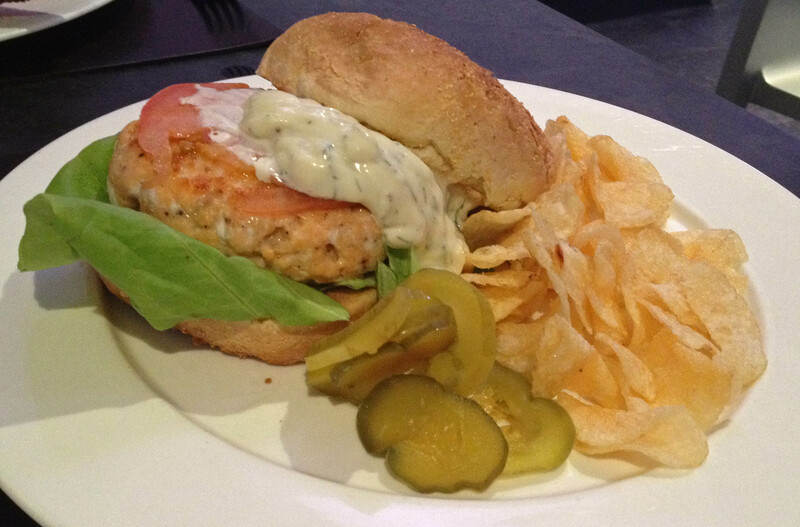 Salmon burger: This is an excellent burger of (smoked?) salmon cooked medium rare with herbs, and served either with lettuce and tomato or with roasted red peppers, pickled red onion, and the very fresh lemon-herb mayo. This burger is simply delicious. I am not a huge fan of salmon that is neither smoked nor sushi-grade, but, this is one of the best salmon burgers that I have ever tasted in NYC. Must get this burger if you love salmon. 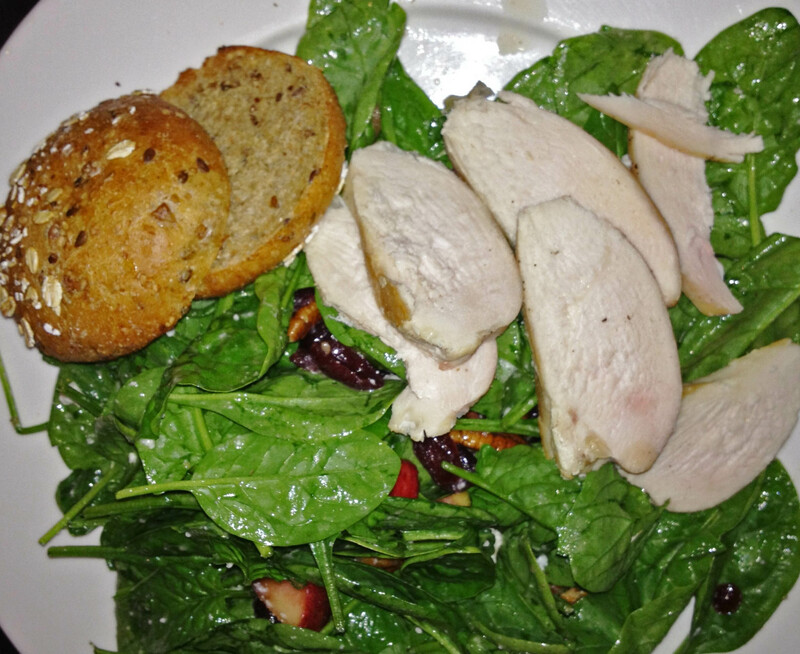 Market salad: The market salad includes spinach, feta, apples, dried cranberries, and a honey-apple cider vinaigrette. The salad includes either pistachios or candied almonds or walnuts (not sure if the choice of nuts depends on the season or on some other factor unknown to me). Other seasonal ingredients are mango and strawberries during the Summer and butternut squash in the Fall. I love this salad’s combination of salty feta, and sweet-tart cranberries and the crunch of the nuts in the sweet honey-apple cider vinaigrette. You can get this as a vegetarian (vegan salad) salad or with roasted chicken. We have always had excellent service and a quiet brunch at a.cafe. One of the best features of this cafe is the private room at the back where there is ample space to park a stroller or multiple shopping bags (especially if you are returning from Bergdorf Goodman or Tiffany or the like during the holiday season or otherwise). On the other hand, if you are looking for one of the top hot spots for weekend brunch, check-out this page from Eater NY. the market salad does look very interesting. it could do with a few more ingredients – wonder why they choose one of the nuts, instead of including all of them ? I agree, more nuts the better.